The Thistle Golf Club in Sunset Beach, N.C. recently announced plans to change their greens from L93 bentgrass to a form of ultradwarf Bermudagrass. The project is expected to be completed by early October. The Thistle has long been a favorite among locals and tourists. The Tim Cate design features 27-holes and opened for play in 1999 and 2000. The Mackay nine greens were changed to TifEagle Bermuda this past year when those holes were closed from June through September. The plans call for the Cameron nine to close from May 11 through July 1 for the transition to TifEagle, and the Stewart nine will close from July 2 into late September or early October. The course will maintain 18 open holes throughout the transition. The ultradwarfs grasses have gained in popularity along the Grand Strand in recent years because it is more tolerant to the warm weather and is less labor intensive. Summertime was especially difficult on the greens at the Thistle and they had to avoid twilight summer rates to limit the traffic. The chemical cost to maintain the greens is approximately the same but the labor costs are significantly lower with the ultradwarf turf because it doesn’t require hand watering during the day like bentgrass. The Thistle has also followed the recent trend to not overseed their greens for the winter months. They intend to maintain coloration by applying pigments. This also provides a very good putting surface while reducing labor costs. The changeover at Thistle leaves just 10 Grand Strand courses with bentgrass greens, with seven of those in Brunswick County. There are now nearly 60 area courses with ultradwarf Bermuda greens. Other work at the Thistle includes bunker renovation, drainage work and some new bulkhaeds. The Thistle was purchased out of foreclosure 16 months ago by the family of Jack and Debbie Davis of Windemere, Florida. They also own International Golf Club of Myrtle Beach in Murrells Inlet. 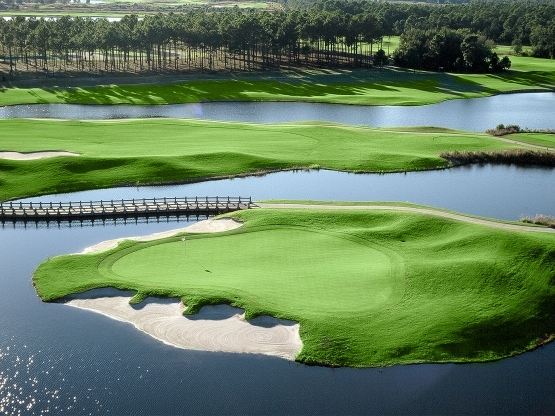 You will be so happy that you added the Thistle Golf Club to your Myrtle Beach golf package. Course was in great shape. Great club house! Top notch all around. Truly one of the classiest golf clubs I have ever played. The course was top notch, greens were in excellent condition; soft and fast in the morning... hard and fast on the 2nd 9. I really liked this course, fun and challenging. Keep your ball in the fairway, and you will enjoy this course as much as I did. But anytime you mishit one...trouble. The woods were very thick, and I have never seen so many snakes in my life. These long, skinny black/almost blue snakes were EVERYWHERE. Some were afraid of you, and would scare the living crap out of you when they're getting out of your way. And some (the bigger ones) were not afraid of you...and would not move. I want to play there again, but I think I will wait until Peter Piper makes a pass and get the snakes out.